Q. What should I do if I have lost or damaged a library book at East? If you have lost or damaged a library book you will need to replace it to avoid having your borrowing limits restricted or being invoiced for a replacement by the Finance Department. You can replace the exact title yourself by purchasing it at a local bookstore, or online. We recommend http://www.bookdepository.com because they will ship to Singapore free of charge and are very reliable. You can even have the book shipped directly to school. 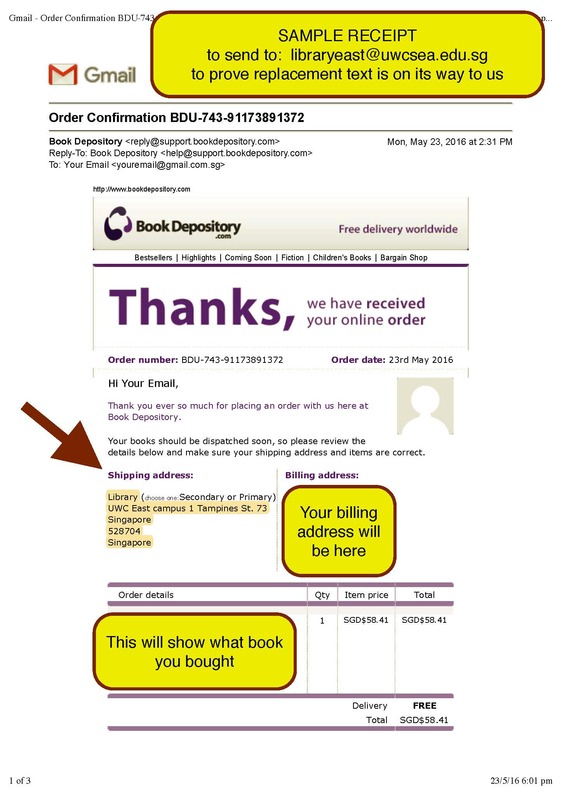 Just email us your confirmed order with our address on it and we will consider the book replaced (see the sample invoice below) or when you bring in the replacement copy we will take it off your library record. Alternatively, you can come to the library and we will order it for you. Once the order is placed the book will be taken off your library record immediately - no need to wait for delivery. If the exact book is no longer available for purchase and/or no longer required by the library, the librarian will suggest a replacement title of equal value. Once finance has issued an invoice we will be unable to accept a replacement or returned book as it will have been removed from the library system.